This part is easy with Ancestry, because Ancestry doesn’t accept any other vendor’s files. There is no ability to upload TO Ancestry. You have to test with Ancestry if you want results from Ancestry. In order to transfer your autosomal DNA file to another testing vendor, or GedMatch, for either matching or ethnicity, you’ll need to first download the file from Ancestry. Sign in to your account at Ancestry and click on the DNA Results Summary link. Click on the Settings gear, at the far upper right hand corner of the summary page, just beneath your Ancestry user ID. Enter your password and click on “I Understand,” after reading of course. At that point, the confirm button turns orange – click there. Ancestry will send an e-mail to the e-mail address where you are registered with Ancestry. Check your inbox for that e-mail. If the e-mail doesn’t arrive shortly, check your spam folder. If you’ve changed e-mail addresses, check to be sure your new one is registered with Ancestry. That’s on the same Settings page. If all else fails, request the e-mail again. Click on the green “Confirm Data Download” and do not close the window. You’ll see the following confirmation screen. At the bottom of the page, above, if you’re on a PC, you’ll see the typical file download box that asks you if you want to open or save. Save the file as a name you can find later when you want to upload to another site. The file name will be “dna-data-2018-07-31” where the date is the date you downloaded the file. I would suggest adding the word Ancestry to the front when you save the file on your system. Ancestry testing falls into two different categories. V1 tests taken before May of 2016 and V2 tests taken after May 2016. Tests processed during May 2016 could be either version. The difference between V1 and V2 files is that Ancestry changed the chips they use to test and different DNA positions are tested, resulting in a file of a different format. If you don’t remember when you tested, make a copy of your Ancestry file using a different name, like, “Opened Ancestry file 7-31-2018.” Then just click to open the zip file. This is a version 1 (V1) file. A version 2 file will say V2.0. *Note that 23andMe earlier in 2018 allowed a one-time transfer from Ancestry, but people who transferred results did not receive matches from 23andMe. **Note that the transfer to Family Tree DNA and matching is free, but advanced tools including the chromosome browser and ethnicity require a $19 unlock fee. That fee is less expensive than retesting, but V2 customers should consider retesting to obtain fully compatible matching and ethnicity results. V2 tests typically receive only the closest 20-25% of matches they would receive if they tested directly at Family Tree DNA. ***MyHeritage utilizes a technique known as imputation to achieve compatibility between different vendors files. The transfer and tools are free, but without a subscription you can’t fully utilize all of the MyHeritage benefits available. ****I’m not sure exactly how GedMatch compensates for the V1 versus V2 differences, but they can handle both data file types. Most people don’t take both tests, but I was conducting an experiment and have uploaded both V1 and V2 tests. A quick survey of GedMatch matches to my Ancestry V1 and Ancestry V2 kits shows that of my first 249 (125 V2, 124 V1) matches, I have 3 V1 tests that don’t have a corresponding match to a person on the V2 kit, and 5 V2 kits that don’t have a corresponding V1 kit match. That’s roughly a 6% nonmatch rate between Ancestry V1 and V2 kits. I would presume that as the genealogical and genetic distance increases with more distant matches, so would the percentage of non-matches because the segment size is smaller with more distant matches, so there is less matching DNA to have the opportunity to match in the first place. My recommendation, if you test at Ancestry, is to transfer your V1 results to MyHeritage, Family Tree DNA and GedMatch. An Ancestry V1 test is entirely compatible at Family Tree DNA, but with a V2 test, because the testing platform that Ancestry uses is only about 20-25% compatible with the Family Tree DNA test, you’ll only receive your closest 20-25% matches. Family Tree DNA can’t match on those smaller segments if you don’t test on a compatible platform, so please do. If you have Ancestry V2 results, transfer to MyHeritage and GedMatch but retest at Family Tree DNA. The cost difference at Family Tree DNA between the $19 unlock and a new Family Finder test is $60, for a total of $79 when the tests aren’t on sale. When they are on sale, it’s less. Right now, the tests are only $59. You never know which match is going to break down that brick wall, and it would be a shame to miss it because you transferred rather than retested. Matching and ethnicity is free with a transfer to MyHeritage, but you won’t receive the full potential benefit of SmartMatching without a subscription, as free trees are limited to 250 people and genealogical records aren’t included without a subscription. My subscription has been well worth the $. Not long ago, Jonny Perl introduced the free online tool, DNA Painter, designed to paint your chromosomes. I didn’t get around to trying this right away, but had I realized just how much fun I would have, I would have started sooner. Fittingly, Jonny, pictured above, won the RootsTech Innovation award this year for DNA Painter – and I must say, it’s quite well-deserved. This is the first of four articles about DNA Painter. In this article, we’ll talk about how to use the tool, and how to get started. The second article talks about mining your matches at the various vendors for paintable segments with instructions for how to do that accurately with each vendor. In the third article, we’ll walk through an analysis of my painted segments, so you can too – and know how to spot revelations. The fourth article explains how I solved a long-standing mystery that was driving me crazy. If you have a relatively close mystery person in your DNA match list that you can’t figure out quite where they fit, this article is written just for you! I’ll tell you right now, I haven’t had this much fun in a long time! Want to hear the best part? You don’t have to triangulate. DNA painting is “self-triangulating.” Yes, really! To begin to use DNA Painter, you’ll need to set up a free account at www.dnapainter.com. Read the instructions and create your profile. Jonny provides an overview. Don’t get so excited that you skip this, or you won’t know how to paint correctly. You don’t need to be Picasso, but taking a few minutes up front will save you mistakes and frustration later. Blaine Bettinger recorded a YouTube video discussing how to use DNA Painter to paint your chromosomes to identify and attribute particular segments to specific ancestors. It includes a mini-lesson on chromosome matching. I strongly suggest you take time to watch Blaine’s video from the beginning. For some reason, this link drops into the video near the end, but just slide the red bar back to the beginning. Here’s my blank, naked chromosomes. Notice for every chromosome, you see a blue paternal “half” and a pink maternal “half.” That’s because everyone gets half of their autosomal DNA from their father, and the other half from their mother. Looking at my own chromosome painting today, below, it’s incredibly exciting for me to see 57% of my DNA painted, attributed to 77 couples and one endogamous group, Acadians. This took me a month or so working off and on. At the end of the day, this is often how I rewarded myself! The only problem it that it has been difficult to go to bed. Comparatively, I’ve been working on my DNA match spreadsheet, attributing segments to ancestors now for 5 or 6 years, and I’ve never been able to see this information visually like this before. This view of my ancestrally painted chromosomes is so rewarding! DNA Painter is not the kind of tool where you upload your results, it’s a tool where you selectively paint specific segments of matches – meaning segments on which you match particular people with known common ancestors. How do you know who is a good candidate to map? I began with painting my closest matches with whom I could identify the common ancestor. Not only will painting your largest matches be rewarding as you harvest low-hanging-fruit, it will help you determine if you actually have identified the correct DNA for later matches being attributed to a specific genealogical line. In other words, mapping these larger known segments will help you identify false positives when you have no other yardstick. I’m opening a new profile in DNA Painter to demonstrate the steps in painting along with hints that I’ve learned along the way. I’m going to utilize my cousin, Cheryl, whom I match closely at Family Tree DNA. If you don’t know how to use the Family Tree DNA autosomal tools, click here. Cheryl is my first cousin once removed, so we share a significant amount of DNA. I’ve selected Cheryl on my match list, checked her match box, and then clicked on the Chromosome Browser in order to view our segment matching information. You can see on the chromosome browser that I share quite a bit of DNA with Cheryl. Highlight and copy all of the segments for Cheryl. I only use 7cM segments or higher at DNA Painter, so you don’t have to copy the data in the rows below your last match at that level. DNA Painter takes care of stripping out all the extraneous stuff. Simply paste the segment data into the box in the window that pops up. DNA Painter takes care of removing the header information as well as segments that are too small. You can click on “overlay these segments” to “test” a fit, but I haven’t really found a good use for that, because I’m only painting segments I’m confident about and I know which side, maternal or paternal, the match is on based on the known relative. Click on “save match now” in the bottom right corner. In the Save Match popup, shown above, I utilize the fields as follows. In the “Segment/Match Notes” I list how the match descends from the common ancestral couple, a GedMatch ID if known, and anything else pertinent including other potential ancestral lines in common. This means that I list every generation beginning with the common ancestral couple and ending with the tester. You’ll wind up eventually rethinking some of your segment assignments to particular ancestors and you’ll want as much information here about this match as possible. Moving to the next field, in the “Ancestors Name,” I utilize the couples name, because at this point, you can’t tell which of the two people actually contributed the DNA segment, or if part is from one ancestor of the couple and part is from the other. If the male ancestor is a Sr. or Jr., or is otherwise difficult to tell apart from your other ancestors, I suggest entering a birth year by his name. This is your selection list for later painting segments from the same ancestor, so you want to be sure you can tell the generations apart. Next, you’ll select the maternal or paternal side of your family. Change the color if you don’t like the one pre-selected to assign to segments descending from that couple. Originally, I was going to have pinks or light colors for maternal, and blues or darker for paternal, but I quickly discovered that scheme didn’t work well, and I had more ancestors than I could ever have imagined whose DNA I am be able to map and paint. Therefore, pick contrasting colors. You can use each color on each half, meaning maternal and paternal, since the segments will be painted on different halves of the chromosome. In the “Notes for This Group,” I add more information for the couple such as birth and death dates and location if I know or am likely to forget. Here you go! Isn’t this fun!!!! Cheryl’s segments that match mine are painted onto my chromosomes! At the right, your ancestor key appears with each ancestor to whom you’ve assigned a color key. So far, I only have one! Want to paint another group of segments? I select Hiram Ferverda, Eva Miller and save. The segments that I have in common with Cheryl and/or Don will now be displayed on each chromosome. Looking at chromosome 1, you can see that I match Cheryl and Don on the same segment at the beginning of the chromosome, but received two different segments of DNA on a different portion of chromosome 1, further to the right. As one last example, I added the DNA from two known cousins, Rex and Maxine, who descend a couple generations further back in time through more distant ancestors in the same line – one maternal and one paternal. Rex (yellow) and Maxine (blue) both match me on different parts of the chromosome. It looks like there is a small amount of overlap between Rex and Maxine which is certainly feasible, because Jacob Lentz, the ancestor that Maxine descends from is ancestral to the couple that Rex descends from. By utilizing known matches, and mapping, we can see segments that move us back in time, telling us from which ancestor that portion of the segment descends. For example, if the blue segment was directly aligned with one of the pink segments, then we would know that the blue portion of the pink segment descended from Jacob Lentz and Fredericka Reuhl. This is the most awesome, extremely addictive game of ancestor Sukoku ever. Here’s how to prepare for my next article where we’ll utilize the various vendor matches to begin painting. You’ll want to have your DNA at the most vendor locations possible so you can find all your matches that can be attributed to known relatives and ancestors. You never know who is going to test at which vendor, and the only way to find out is to have your DNA there too. For each vendor, I’ve provided a mini-tutorial on how to maximize your testing and transfers both monetarily and for maximum matching effect, or you can read an article here that explains more. There’s also a cheat sheet for transfer strategies at the end of this article. A technique called imputation is mentioned below, so you may want to read about imputation here. MyHeritage’s initial offering utilizing imputation was problem plagued but has since improved significantly. To Ancestry – There’s no way to transfer files TO Ancestry, so you’ll need to test there to be in their database. You will also need at least a minimum subscription ($49) to utilize all of the Ancestry DNA features. You can see a with and without subscription feature comparison chart here. My preference is to test at Ancestry, and then test at Family Tree DNA and upload the test results to MyHeritage. The Family Tree DNA and MyHeritage testing platforms are the same, so there is no incompatibility between the two. To Family Tree DNA – You can upload the following vendor files TO Family Tree DNA. Matching is free, but to use the advanced tools, including ethnicity and the chromosome browser, you’ll need to pay the $19 unlock fee. That’s still significantly less than retesting, especially for files that are 100% compatible. To 23andMe – You cannot transfer TO 23andMe, so you’ll need to test there if you want to be in their database. GedMatch – V3 file from Dec 2010-Nov 2013 and V4 file from November 2013-August 2017 are compatible, the V5 chip beginning in August 2017 is only compatible in the Genesis sandbox area. V5 matching is not reliable. Files from other vendors are recommended for GedMatch unless you are matching against another V5 result. GedMatch is a third-party site that accepts all of these vendors’ autosomal files, with a caveat that the 23andMe V5 kit matches very poorly and requires special handling. I don’t recommend using that kit at GedMatch unless you are matching against other 23andMe V5 kits. I upload multiple kits to GedMatch and mark all but one for research only. This allows me to use my Ancestry kit to match with other Ancestry users for more accurate matches, my Family Tree DNA kit to other Family Tree DNA kits, and so forth. Not marking multiple kits for research means that you’ll appear more than once on other people’s match lists, and only your first 2000 matches are free. Marking all kits except one as research is a courtesy to others. Test at Ancestry and download to GedMatch. Test at Family Tree DNA and upload to MyHeritage and GedMatch. Test at 23andMe and upload to GedMatch Genesis. At GedMatch, mark all except one kit as “research,” then utilize your kits from the same vendor for one-to-one comparisons. Of course, where you have, and haven’t already tested will impact your transfer strategy decision. I’ve prepared the following cheat sheet to be used in combination with the information discussed above. *Unless you can transfer a 23andMe V3/V4 or an Ancestry V1 kit to Family Tree DNA, it’s better to test at Family Tree DNA. Ancestry V2 tests are only 20-25% compatible. A transfer from Family Tree DNA to MyHeritage is best because those vendors are on the same platform and the tools at MyHeritage are free. In my next article, we’ll discuss how to mine your matches at the various vendors to obtain accurate segments for chromosome painting – including a strategy for how to utilize Ancestry and Gedmatch together to identify at least some Ancestry segment matches. So, for now, get ready by transferring your matches into whichever data bases they aren’t already in. The only data base where I couldn’t identify matches that I didn’t have elsewhere was at 23andMe. The rest were all there just waiting to be harvested! In the recent article about Oxford Ancestors shuttering, I briefly mentioned GDPR. I’d like to talk a little more about this today, because you’re going to hear about it, and I’d rather you hear about it from me than from a sky-is-falling perspective. It might be rainy and there is definitely some thunder and the ground may shake a little, but the sky is not exactly falling. The storm probably isn’t going to be pleasant, however, but we’ll get through it because we have no other choice. And there is life after GDPR, although in the genetic genealogy space, it may look a little different. And yes, one way or another, it will affect you. GDPR, which is short for General Data Protection Regulation, is a European, meaning both EU and UK, regulation(s) by which the European Parliament, the Council of the European Union, and the European Commission intend to strengthen and unify data protection for all individuals within the European Union (EU). It also addresses the export of personal data outside the EU/UK and processing of data of residents of the EU/UK by non-EU/UK companies. There are actually two similar, but somewhat different regulations, one for the UK and one for the EU’s 28 member states, but the regulations are collectively referred to as the GDPR regulation. The regulations are directly enforceable and do not require any individual member government to pass additional legislation. GDPR was adopted on April 27, 2016, but little notice was taken until the last few months, especially outside of Europe, when the hefty fines drew attention to the enforcement date of May 25, 2018, now just around the corner. Those hefty fines can range from a written warning for non-intentional noncompliance to a fine of 20 million Euro or up to 4% of the annual worldwide turnover of the preceding financial year, whichever is GREATER. Yea, that’s pretty jaw-dropping. So, GDPR has teeth and is nothing to be ignored. Oh, and if you think this is just for EU or UK companies, it isn’t. It applies equally to any company that possesses any data of any EU or UK resident in their data base or files, providing that person isn’t dead. The law excludes dead people and makes some exceptions for law enforcement and other national security types of applications. Otherwise, it applies to everyone in a global economy – and not just for future sales, but to already existing data for anyone who stores, transmits, sells to or processes data of any EU resident. The intent of GDPR was to strengthen privacy and data protections, but there is little latitude written into this regulation that allows for intentional sharing of data. The presumption throughout the hundreds of pages of lawyer-speak is that data is not intended to be shared, thereby requiring companies to take extraordinary measures to encrypt and anonymize data, even going so far as to force companies to store e-mail addresses separately from any data which could identify the person. Yes, like a name, or address. Ironic that a regulation that requires vendor language be written in plainly understood simple wording is in and of itself incredibly complex, mandating legal interpretation. Needless to say, GDPR requirements are playing havoc with every company’s data bases and file structure, because information technology goals have been to simplify and unify, not chop apart and distribute information, requiring a complex network of calls between systems. Know who loves GDPR? Lawyers and consultants, that’s who! In the case of intentional sharing, such as genetic genealogy, these regulations are already having unintended consequences through their extremely rigid requirements. For example, a company must appoint a legal representative in Europe. I am not a lawyer, but my reading of this requirement suggests that European appointed individual (read, lawyer) is absorbing some level of risk and could potentially be fined as a result of their non-European client’s behavior. So tell me, who is going to incur that level of risk for anything approaching a reasonable cost? One of the concepts implemented in GDPR is the colloquially known “right to be forgotten.” That means that you can request that your data and files be deleted, and the company must comply within a reasonable time. However, what does “the right to be forgotten” mean, exactly? Does it mean a company has to delete your public presence? What about their internal files that record that you WERE a customer. What about things like medical records? What about computer backups which are standard operating procedure for any responsible company? What happens when a backup needs to be restored? If the company tracks who was deleted, so they can re-delete them if they have to restore from backup, then the person isn’t deleted in the first place and they are still being tracked – even though the tracking is occurring so the person can be re-forgotten. Did you follow that? Did it make sense? Did anyone think of these kinds of things? Oh, and by the way, there is no case law yet, so every single European company and every single non-European company that has any customer base in Europe is scrambling to comply with an incredibly far-reaching and harsh regulation with extremely severe potential consequences. How many companies do you think can absorb this expenditure? Who do you think will ultimately pay? Younger people may not remember Y2K, but I assuredly do, and GDPR is Y2K on steroids and with lots of ugly teeth in the form of fines and penalties that Y2K never had. The worse scenario for Y2K was that things would stop working. GDPR can put you out of business in the blink of an eye. The “controller” is pretty well defined as the company that receives and processes the data or order, and a “processor” is any other entity, including an individual person, who further processes data on behalf of or as a result of the controller. There appears to be no differentiation between a multi-million-dollar company and one person doing something as a volunteer at home for most requirements – and GDPR specifically says that lack of pay does not exempt someone from GDPR. The one possible exception that exists in that there is an exclusion for organizations employing less than 250 persons, ”unless processing is likely to result in a risk to the rights and freedoms of the data subject.” I’m thinking that just mentioning the word DNA is enough to eliminate this exemption. Furthermore, GDPR states that controllers and processors must register. Right about now, you’re probably asking yourself if this means you if you’re managing multiple DNA kits, working with genetic genealogy, either as a volunteer or professionally, or even managing a group project or Facebook group. The answer to those questions is that but we really don’t know. ISOGG has prepared a summary page addressing GDPR from the genetic genealogy perspective, here. The ISOGG working group has done an excellent job in summarizing the questions, requirements and potential effects of the legislation in the slide presentation, which I suggest you take the time to view. This legislation clearly wasn’t written considering this type of industry, meaning DNA shared for genealogical purposes, and there has been no case law yet surrounding GDPR. No one wants to be the first person to discover exactly how this will be interpreted by the courts. The requirements for controllers and processors are much the same and include very specific requirements for how data can be stored and what must be done in terms of the “right to be forgotten” requests within a reasonable time, generally mentioned as 30 days after the person who owns the data requests to be forgotten. This would clearly apply to some websites and other types of resources used and maintained by the genetic genealogy community. If you are one of the people this could affect, meaning you maintain a website displaying results of some nature, you might want to consider these requirements and how you will comply. Additionally, you are required to have explicitly given consent for every person’s results that are displayed. For genetic genealogists, who regularly share information through various means, and the companies who enable this technology, GDPR is having what I would very generously call a wet blanket effect. 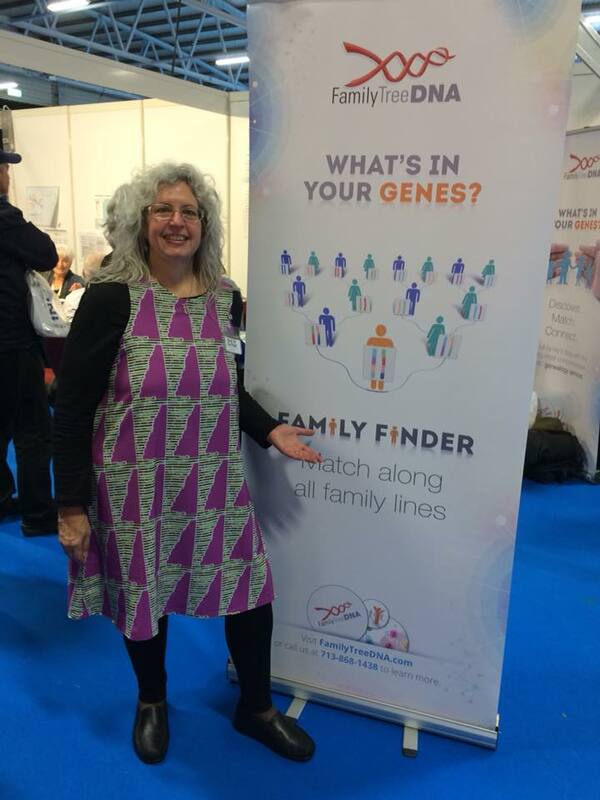 What’s Happening in the Genetic Genealogy Space? Oxford Ancestors has announced they are shuttering, although they did not say that their decision has anything to do with GDPR. The timing may be entirely coincidental. Ancestry has recently made unpopular decisions relative to requiring separate e-mails to register different accounts, even if the same person is managing multiple DNA kits. Ancestry did not say this had to do with GDPR either, but in reading the GDPR requirements, I can understand why Ancestry felt compelled to make this change. Family Tree DNA recently removed a search feature from their primary business page that allowed the public to search for their ancestors in trees posted to accounts at Family Tree DNA. According to an e-mail sent to project administrators, this change was the result of changes required by GDPR. They too are working on compliance. I haven’t had an opportunity to speak privately with LivingDNA or 23andMe, but I would presume both are working on compliance. LivingDNA is a UK company. One of my goals recently when visiting RootsTech was to ask vendors about their GDPR compliance and concerns. That’s the one topic sure to wipe the smile off of everyone’s face, immediately, generally followed by grimaces, groans and eye-rolls until they managed to put their “public face” back on. In general, vendors said they were moving towards compliance but that it was expensive, difficult and painful – especially given the ambiguity in some of the regulation verbiage. Some expressed concerns that GDPR was only a first step and would be followed by even more painful future regulations. I would presume that any vendor who is not planning to become compliant would not have spent the money to have a booth at RootsTech. The best news about GDPR is that it requires transparency – in other words, it’s supposed to protect customers from a company selling your anonymized DNA out the back door without your explicitly given consent, for example. However, the general consensus was that any company that wanted to behave in an unethical manner would find a loophole to do so, regardless of GDPR. In fairness, hurried consumers bring this type of thing on themselves by clicking through the “consent,” or “agree” boxes without reading what they are consenting to. All the GDPR in the world won’t help this. The company may have to disclose, but the consumer doesn’t have to read, although GDPR does attempt to help by forcing you to actively click on agree. I’m sure we’ll all be hearing more about GDPR in the next few weeks as the deadline looms ever closer. There’s nothing you can do about the effects of GDPR, except hold on tight as the vendors on which we depend do their best to navigate this maze. Between now and May 25th, and probably for some time thereafter, I promise to be patient and not to complain about glitches in vendors’ systems as they roll out new code as seamlessly as possible. For those of you who are really gluttons for punishment, here are the actual links to the documents themselves. Of course, they are also guaranteed to put you to sleep in about 27 second flat…so a sure cure for insomnia. Who Tests the X Chromosome? Recently, someone asked which of the major DNA testing companies test the X chromosome and which ones use the X in matching. How does this difference influence the quality of our matches? *If Ancestry did utilize the X in matching, it wouldn’t benefit customers because Ancestry does not show segment information by chromosome. In other words, no chromosome browser. Family Tree DNA includes any size X match IF and only if the two people already match on a different chromosome. GedMatch, of course, isn’t a vendor who does DNA testing, so they don’t provide download files. They are solely on the receiving end. Due to variations in the way vendors calculate matches and total cM counts, your mileage may vary a bit. In other words, the 23andMe cM total, if an X match is involved, may be slightly more than a match between the same two people at Family Tree DNA, where the X match cM is not included in the cM total. Conversely, you won’t show an X match with someone at Family Tree DNA if there isn’t also another segment on a different chromosome that matches. In general, due to the thin spread of SNPs on the X chromosome, you will need, on average, a cM match that is twice as large as on other chromosomes to be considered of equal weight. In other words, a 10 cM match on the X chromosome would only be genealogically equivalent to approximately a 5 cM match on any other chromosome. X matches really can’t be evaluated by the same rules as other chromosomes due both to their SNP paucity and their inheritance path, which is why most vendors don’t include those segments in the total cM count. While including the X chromosome cM count is problematic, X matching can be a huge benefit because of the unique inheritance path of the X chromosome. In the article, X Marks the Spot, we discussed the inheritance path of the X chromosome for both males and females. Females inherit an X chromosome from both father and mother, which recombines just like chromosomes 1-22. However, men only inherit an X from their mother, because they inherit a Y from their father instead of the X. Therefore, males will only inherit an X from their mother, and females will only inherit their father’s mother’s X chromosome. Charting Companion software works with your genealogy software of choice to produce a lovely fan chart where the contributors of my X chromosome are charted in color, above. You can read more about Charting Companion here. The great news is that if you and a match share a significant portion of the X chromosome, meaning more than 15 cM which reduces the likelihood of an identical by chance match, the common ancestor (on that segment) has to come from an ancestor in your direct X path. I’m always excited to see with whom I share an X. That piece of information alone helps me focus my ancestor detective efforts on a specific portion of my tree. Some X segments can remain intact for generations and may be very old. So don’t be surprised if the common ancestor of the X segment and another matching segment may not be the same ancestor. I wasn’t able to find a way to sort by X chromosome matches at 23andMe, but you can sort by the X at both Family Tree DNA and GedMatch. At GedMatch, X matching shows on the one-to-many match page. You can sort by either Total X cM or Largest X cM by using the up and down arrows, at right, below, in the X DNA columns. After you identify an X match, be sure to run the X one-to-one match option to verify. My GedMatch matches cause me to wonder if 23andMe is using a different reporting threshold for the X chromosome, because one of my matches at GedMatch is a close family member with no X match at 23andMe, but a total of 32 X cM and with a longest segment of 14 X cM at GedMatch. That same individual matches me with the largest X segment of 14 cM at Family Tree DNA as well. At Family Tree DNA, on your Family Finder matches page, just click on the X-Match header (at right, below) to bring all of your X matches to the top of your list. If you have linked any kits of relatives to your tree, you will see numbers of phased kits on the maternal and paternal tabs with the red and blue male and female icons. In the example above, I have 3313 matches total, with 744 being paternal, 586 being maternal. Next, click on the maternal or paternal tab to see only the people with X matches who match you on the your maternal and paternal lines. Matches are automatically sorted into maternal and paternal “buckets” for you. Remember to check the size of the X match before deciding about relevance. Who is your largest X match that you don’t already know? Maybe you can find your common ancestor today. DNAGedcom provides an incredibly cool tool that has helped me immensely with my genealogy research, particularly at Ancestry and Family Tree DNA. This tool doesn’t replace what Ancestry and Family Tree DNA provide, but augments the functionality significantly. I’ve been frustrated for months by the broken search function at Ancestry, and the DNAGedcom tool allows you to bypass the search function entirely by downloading the direct line ancestral information for all of your matches. So let’s use my Ancestry account as an example. After installing the DNAGedcom tool on your system, sign on to your Ancestry account through the tool. The tool downloads all of your matches, the people you match in common with them, and the ancestors in your matches’ trees. The best part about this is that the results are then in a spreadsheet file that you can simply sort utilizing normal spreadsheet functions. I wrote about using spreadsheets for genetic genealogy in the article, Concepts – Sorting Spreadsheets for Autosomal DNA. In my case, this means I can see everyone who I match that has an Estes, or any other surname, in their tree. I don’t have to look at my matches’ trees one at a time. You can read about this very cool tool at this link, including how to subscribe for either $5 per month or $50 per year. Many functions at DNAGedcom are free, but the Ancestry tool is available through a minimal subscription which helps to support the rest of the site. After subscribing, the DNAGedcom client will become available to you on your subscriber page at DNAGedcom. After you subscribe, you’ll see the link for the Ancestry download tool, along with other resources. You will want to follow the installation directions, exactly, to download the DNAGedcom client onto your PC or Mac in preparation for downloading your Ancestry match information onto your system. This is painless and goes quickly. It’s important to make a note of this, as I didn’t find the file names documented elsewhere. The good news is that even though these steps take a long time, having all of this information in a place where you can sort it and use it effectively is extremely useful. You can run the various steps at night or when you aren’t otherwise using your system. In addition, if someone is sharing their DNA results with you on Ancestry (which they can under the settings gear), you can download the same data for their account – and then you can look for commonalities between groups of results using the DNAGedcom Match-O-Matic tool, also described in the introductory document. Personally, what I wanted to do was to search for all occurrences of a particular surname. Fortunately, it was Claxton or Clarkson, not Smith. Simply using Excel (after saving the results file in Excel format), I was able to quickly sort for these surnames, an example shown below. Hmmm, I wonder if Claxon is relevant too. I never considered that possibility – nor would I have ever seen Claxon in a surname search, because I wouldn’t have searched for Claxon..
I’m brick walled on the Claxton line in Russell County, Virginia in about 1799. My ancestor, James Lee Claxton, was born someplace in Virginia about 1775. Utilizing Y DNA, we know of another man, also named James Claxton, born about 1750 first found in Granville and Bertie County, NC, who sired an entire lineage of Claxtons who migrated to Bedford County, TN. However, that James is not the father of my ancestor, because that James had a different son named James. Other than these two distinct groups, we can’t seem to match with anyone else who has tested their Y DNA at Family Tree DNA, so my hope, for now, is an autosomal match with a known Claxton line out of Virginia. Therefore, my goal is to find matches to other Claxton or Clarkson individuals who don’t share a known common known ancestor with me. Because we don’t share a known common ancestor, of course, these people would never be shown as an Ancestry green leaf “DNA+tree match,” nor is there another way for me to obtain a surname list like this at Ancestry. After finding Claxton candidates, then I can refer to the other downloaded files or sign on to my account at Ancestry to look at the match itself and other ICW matches. Hopefully, some of my matches will also match some of my Claxton cousins as well, which would suggest that the match might actually be through the Claxton line. The DNAGedcom client also downloads the same type of information from 23andMe, which isn’t nearly as useful without trees, as well as from Family Tree DNA. Thanks so much to www.dnagedcom.com. Every year for the past 17 years has been the year of DNA for me, but for many millions, 2017 has been the year of DNA. DNA testing has become a phenomenon in its own right. In 2014, it seemed like most people had heard of DNA, even if they weren’t all testing yet. John Q. Public was becoming comfortable with DNA. If you’re a genealogist, you certainly know about DNA testing, and you’re behind the times if you haven’t tested. DNA testing is now an expected tool for genealogists, and part of a comprehensive proof statement that meets the genealogical proof standard which includes “a reasonably exhaustive search.” If you haven’t applied DNA, you haven’t done a reasonably exhaustive search. A paper trail is no longer sufficient alone. When I used to speak to genealogy groups about DNA testing, back in the dark ages, in the early 2000s, and I asked how many had tested, a few would raise their hands – on a good day. In October, when I asked that same question in Ireland, more than half the room raised their hand – and I hope the other half went right out and purchased DNA test kits! Consequently, because the rabid genealogical market is now pretty much saturated, the DNA testing companies needed to find a way to attract new customers, and they have. I’m not positive that the methodology some of the major companies utilized to attract new consumers is ideal, but nonetheless, advertising has attracted many new people to genetic genealogy through ethnicity testing. If you’re a seasoned genetic genealogist, I know for sure that you’re groaning now, because the questions that are asked by disappointed testers AFTER the results come back and aren’t what people expected find their way to the forums that genetic genealogists peruse daily. I wish those testers would have searched out those forums, or read my comparative article about ethnicity tests and which one is “best” before they tested. More ethnicity results are available from vendors and third parties alike – just about every place you look it seems. It appears that lots of folks think ethnicity testing is a shortcut to instant genealogy. Spit, mail, wait and voila – but there is no shortcut. Since most people don’t realize that until after they test, ethnicity testing is becoming ever more popular with more vendors emerging. In the spring, LivingDNA began delivering ethnicity results and a few months later, MyHeritage as well. Ethnicity is hot and companies are seizing a revenue opportunity. DNA testing has become that snowball rolling downhill that morphed into an avalanche. More people are seeing commercials, more people are testing, and people are talking to friends and co-workers at the water cooler who decide to test. I passed a table of diners in Germany in July to overhear, in English, discussion about ethnicity-focused DNA testing. If you haven’t heard of DTC, direct to consumer, DNA testing, you’re living under a rock or maybe in a third world country without either internet or TV. Most of the genetic genealogy companies are fairly closed-lipped about their data base size of DNA testers, but Ancestry isn’t. They have gone from about 2 million near the end of 2016 to 5 million in August 2017 to at least 7 million now. They haven’t said for sure, but extrapolating from what they have said, I feel safe with 7 million as a LOW estimate and possibly as many as 10 million following the holiday sales. MyHeritage recently announced that their data base has reached 1 million, with only about 20% of those being transfers. Based on the industry rumble, I suspect that the other DNA testing companies have had banner years as well. The good news is that all of these new testers means that anyone who has tested at any of the major vendors is going to get lots of matches soon. Santa, it seems, has heard about DNA testing too and test kits fit into stockings! That’s even better news for all of us who are in multiple data bases – and even more reason to test at all of the 4 major companies who provide DNA matching for their customers: Family Tree DNA, Ancestry, MyHeritage and 23andMe. So much happened in 2017, it’s difficult to keep up. MyHeritage entered the DNA testing arena and began matching in September of 2016. Frankly, they had a mess, but they have been working in 2017 to improve the situation. Let’s just say they still have some work to do, but at least they acknowledge that and are making progress. MyHeritage has a rather extensive user base in Europe. Because of their European draw, their records collections and the ability to transfer results into their data base, they have become the 4th vendor in a field that used to be 3. In March 2017, Family Tree DNA announced that they were accepting transfers of both the Ancestry V2 test, in place since May of 2016, along with the 23andMe V4 test, available since November 2013, for free. MyHeritage has since been added to that list. The Family Tree DNA announcement provided testers with another avenue for matching and advanced tools. Illumina obsoleted their OmniExpress chip, forcing vendors to Illumina’s new GSA chip which also forces vendors to use imputation. I swear, imputation is a swear word. Illumina gets the lump of coal award for 2017. I wrote about imputation here, but in a nutshell, the vendors are now being forced to test only about 20% of the DNA locations available on the previous Illumina chip, and impute or infer using statistics the values in the rest of the DNA locations that they previously could test. Early imputation implementers include LivingDNA (ethnicity only), MyHeritage (to equalize the locations of various vendor’s different chips), DNA.Land (whose matching is far from ideal) and 23andMe, who seems, for the most part, to have done a reasonable job. Of course, the only way to tell for sure at 23andMe is to test again on the V5 chip and compare to V3 and V4 chip matches. Given that I’ve already paid 3 times to test myself at 23andMe (V2, 3 and 4), I’m not keen on paying a 4th time for the V5 version. 23andMe moved to the V5 Illumina GSA chip in August which is not compatible with any earlier chip versions. Needless to say, the Illumina chip change has forced vendors away from focusing on new products in order to develop imputation code in order to remain backwards compatible with their own products from an earlier chip set. GedMatch introduced their sandbox area, Genesis, where people can upload files that are not compatible with the traditional vendor files. This includes the GSA chip results (23andMe V5,) exome tests and others. The purpose of the sandbox is so that GedMatch can figure out how to work with these files that aren’t compatible with the typical autosomal test files. The process has been interesting and enlightening, but people either don’t understand or forget that it’s a sandbox, an experiment, for all involved – including GedMatch. Welcome to living on the genetic frontier! I assembled a chart of who loves who – meaning which vendors accept transfers from which other vendors. I suspect but don’t know that Ancestry is doing some form of imputation between their V1 and V2 chips. About a month before their new chip implementation in May of 2016, Ancestry made a change in their matching routine that resulting in a significant shift in people’s matches. Because of Ancestry’s use of the Timber algorithm to downweight some segments and strip out others altogether, it’s difficult to understand where matching issues may arise. Furthermore, there is no way to know that there are matching issues unless you and another individual have transferred results to either Family Tree DNA or GedMatch, neither of which remove any matching segments. Other developments of note include the fact that Family Tree DNA moved to mitochondrial DNA build V17 and updated their Y DNA to hg38 of the human reference genome – both huge undertakings requiring the reprocessing of customer data. Think of both of those updates as housekeeping. No one wants to do it, but it’s necessary. 23andMe FINALLY finished transferring their customer base to the “New Experience,” but many of the older features we liked are now gone. However, customers can now opt in to open matching, which is a definite improvement. 23andMe, having been the first company to enter the genetic genealogy autosomal matching marketspace has really become lackluster. They could have owned this space but chose not to focus on genealogy tools. In my opinion, they are now relegated to fourth place out of a field of 4. Ancestry has updated their Genetic Communities feature a couple of times this year. Genetic Communities is interesting and more helpful than ethnicity estimates, but neither are nearly as helpful as a chromosome browser would be. The good news is that anyone who wants a chromosome browser can transfer their results to Family Tree DNA or GedMatch (both for free) and utilize a chromosome browser and other tools at either or both of those locations. Family Tree DNA charges a one time $19 fee to access their advanced tools and GedMatch offers a monthly $10 subscription. Both are absolutely worth every dime. The bad news is, of course, that you have to convince your match or matches to transfer as well. If you can convince your matches to transfer to (or test at) Family Tree DNA, their tools include phased Family Matching which utilizes a combination of user trees, the DNA of the tester combined with the DNA of family matches to indicate to the user which side, maternal or paternal (or both), a particular match stems from. Sites to keep your eye on include Jonny Perl’s tools which include DNAPainter, as well as Goran Rundfeldt’s DNA Genealogy Experiment. You may recall that in October Goran brought us the fantastic Triangulator tool to use with Family Tree DNA results. A few community members expressed concern about triangulation relative to privacy, so the tool has been (I hope only temporarily) disabled as the involved parties work through the details. We need Goran’s triangulation tool! Goran has developed other world class tools as well, as you can see from his website, and I hope we see more of both Goran and Jonny in 2018. In 2017, a number of new “free” sites that encourage you to upload your DNA have sprung up. My advice – remember, there really is no such thing as a free lunch. Ask yourself why, what’s in it for them. Review ALL OF THE documents and fine print relative to safety, privacy and what is going to be done with your DNA. Think about what recourse you might or might not have. Why would you trust them? My rule of thumb, if the company is outside of the US, I’m immediately slightly hesitant because they don’t fall under US laws. If they are outside of Europe or Canada, I’m even more hesitant. If the company is associated with a country that is unfriendly to the US, I unequivocally refuse. For example, riddle me this – what happens if a Chinese (or fill-in-the-blank country) company violates an agreement regarding your DNA and privacy? What, exactly, are you going to do about it from wherever you live? Third party genetics apps are emerging and are beginning to make an impact. GedMatch, as always, has continued to quietly add to their offerings for genetic genealogists, as had DNAGedcom.com. While these two aren’t exactly an “app”, per se, they are certainly primary players in the third party space. I use both and will be publishing an article early in 2018 about a very useful tool at DNAGedcom. Another application that I don’t use due to the complex setup (which I’ve now tried twice and abandoned) is Genome Mate Pro which coordinates your autosomal results from multiple vendors. Some people love this program. I’ll try, again, in 2018 and see if I can make it all the way through the setup process. The real news here are the new marketplace apps based on Exome testing. Helix and their partners offer a number of apps that may be of interest for consumers. Helix began offering a “test once, buy often” marketplace model where the consumer pays a nominal price for exome sequencing ($80), significantly under market pricing ($500), but then the consumer purchases DNA apps through the Helix store. The apps access the original DNA test to produce results. The consumer does NOT receive their downloadable raw data, only data through the apps, which is a departure from the expected norm. Then again, the consumer pays a drastically reduced price and downloadable exome results are available elsewhere for full price. The Helix concept is that lots of apps will be developed, meaning that you, the consumer, will be interested and purchase often – allowing Helix to recoup their sequencing investment over time. Looking at the Helix apps that are currently available, I’ve purchased all of the Insitome products released to date (Neanderthal, Regional Ancestry and Metabolism), because I have faith in Spencer Wells and truthfully, I was curious and they are reasonably priced. Aside from the Insitome apps, I think that the personalized clothes are cute, if extremely overpriced. But what the heck, they’re fun and raise awareness of DNA testing – a good thing! After all, who am I to talk, I’ve made DNA quilts and have DNA clothing too. Having said that, I’m extremely skeptical about some of the other apps, like “Wine Explorer.” Seriously??? But then again, if you named an app “I Have More Money Than Brains,” it probably wouldn’t sell well. Other apps, like Ancestry’s WeRelate (available for smartphones) is entertaining, but is also unfortunately EXTREMELY misleading. WeRelate conflates multiple trees, generally incorrectly, to suggest to you and another person on your Facebook friends list are related, or that you are related to famous people. Judy Russell reviews that app here in the article, “No, actually, we’re not related.” No. Just no! I feel strongly that companies that utilize our genetic data for anything have a moral responsibility for accuracy, and the WeRelate app clearly does NOT make the grade, and Ancestry knows that. I really don’t believe that entertaining customers with half-truths (or less) is more important than accuracy – but then again, here I go just being an old-fashioned fuddy dud expecting ethics. And then, there’s the snake oil. You knew it was going to happen because there is always someone who can be convinced to purchase just about anything. Think midnight infomercials. The problem is that many consumers really don’t know how to tell snake oil from the rest in the emerging DNA field. You can now purchase DNA testing for almost anything. Dating, diet, exercise, your taste in wine and of course, vitamins and supplements. If you can think of an opportunity, someone will dream up a test. How many of these are legitimate or valid? Your guess is as good as mine, but I’m exceedingly suspicious of a great many, especially those where I can find no legitimate scientific studies to back what appear to be rather outrageous claims. My main concern is that the entire DTC testing industry will be tarred by the brush of a few unethical opportunists. With all of the ads have come a commensurate amount of teeth gnashing and “the-sky-is-falling” type reporting. Unfortunately, many politicians don’t understand this industry and open mouth only to insert foot – except that most people don’t realize what they’ve done. I doubt that the politicians even understand that they are tasting toe-jam, because they haven’t taken the time to research and understand the industry. Sound bites and science don’t mix well. The bad news is that next, the click-bait-focused press picks up on the stories and the next time you see anyone at lunch, they’re asking you if what they heard is true. Or, let’s hope that they ask you instead of just accepting what they heard as gospel. Hopefully if we’ve learned anything in this past year, it’s to verify, verify, verify. I’ve been an advocate for a very long time of increased transparency from the testing companies as to what is actually done with our DNA, and under what circumstances. In other words, I want to know where my DNA is and what it’s being used for. Period. Family Tree DNA answered that question succinctly and unquestionably in December. You can’t get more definitive than that. DTC testing for genetic genealogy must be a self-regulating field, because the last thing we need is for the government to get involved, attempting to regulate something they don’t understand. I truly believe government interference by the name of regulation would spell the end of genetic genealogy as we know it today. DNA testing for genetic genealogy without sharing results is entirely pointless. Consumers really shouldn’t have to do that, and if they do, a short, concise summary should be presented to them BEFORE they purchase so that they can make a truly informed decision. The fantastic news is that with all of the new people testing, a huge, HUGE need for education exists. Even if 75% of the people who test don’t do anything with their results after that first peek, that still leaves a few million who are new to this field, want to engage and need some level of education. In that vein, seminars are available through several groups and institutes, in person and online. Almost all of the leadership in this industry is involved in some educational capacity. In addition to agendas focused on genetic genealogy and utilizing DNA personally, almost every genealogy conference now includes a significant number of sessions on DNA methods and tools. I remember the days when we were lucky to be allowed one session on the agenda, and then generally not without begging! When considering both DNA testing and education, one needs to think about the goal. All customer goals are not the same, and neither are the approaches necessary to answer their questions in a relevant way. New testers to the field fall into three primary groups today, and their educational needs are really quite different, because their goals, tools and approaches needed to reach those goals are different too. Adoptees and genealogists employ two vastly different approaches utilizing a common tool, DNA, but for almost opposite purposes. Adoptees wish to utilize tests and trees to come forward in time to identify either currently living or recently living people while genealogists are interested in reaching backward in time to confirm or identify long dead ancestors. Those are really very different goals. I’ve illustrated this in the graphic above. The tester in question uses their blue first cousin match to identify their unknown parent through the blue match’s known lineage, moving forward in time to identify the tester’s parent. In this case, the grandparent is known to the blue match, but not to the yellow tester. Identifying the grandparent through the blue match is the needed lynchpin clue to identify the unknown parent. The yellow tester who already knows their maternal parent utilizes their peach second cousin match to verify or maybe identify their maternal great-grandmother who is already known to the peach match, moving backwards in time. Two different goals, same DNA test. Curious ethnicity testers who may not even realize that at least some of the vendors offer matching and other tools and services. Genealogists who use close relatives to prove which sides of trees matches come from, and to triangulate matching segments to specific ancestors. In other words, working from the present back in time. The peach match and line above. Adoptees and parent searches where testers hope to find a parent or siblings, but failing that, close relatives whose trees overlap with each other – pointing to a descendant as a candidate for a parent. These people work forward in time and aren’t interested in triangulation or proving ancestors and really don’t care about any of those types of tools, at least not until they identify their parent. This is the blue match above. What these various groups of testers want and need, and therefore their priorities are different in terms of their recommendations and comments in online forums and their input to vendors. Therefore, you find Facebook groups dedicated to Adoptees, for example, but you also find adoptees in more general genetic genealogy groups where genealogists are sometimes surprised when people focused on parent searches downplay or dismiss tools such as Y DNA, mitochondrial DNA and chromosome browsers that form the bedrock foundation of what genealogists need and require. Fortunately, there’s room for everyone in this emerging field. Remember that this blog is fully searchable by keyword or phrase in the little search box in the upper right hand corner. I see so many questions online that I’ve already answered! Please feel free to share links of my blog postings with anyone who might benefit! Note that these recommendations below overlap and people may well be interested in opportunities from each group – or all!! About midyear 2018, this blog will reach 1000 published articles. This is article number 939. That’s amazing even to me! When I created this blog in July of 2012, I wasn’t sure I’d have enough to write about. That certainly has changed. Beginning shortly, the tsunami of kits that were purchased during the holidays will begin producing matches, be it through DNA upgrades at Family Tree DNA, Big Y tests which were hot at year end, or new purchases through any of the vendors. I can hardly wait, and I have my list of brick walls that need to fall. Family Tree DNA will be providing additional STR markers extracted from the Big Y test. These won’t replace any of the 111 markers offered separately today, because the extraction through NGS testing is not as reliable as direct STR testing for those markers, but the Big Y will offer genealogists a few hundred more STRs to utilize. Yes, I said a few hundred. The exact number has not yet been finalized. Family Tree DNA says they will also be introducing new “qualify of life improvements” along with new privacy and consent settings. Let’s hope this means new features and tools will be released too. MyHeritage says that they are introducing new “Discoveries” pages and a chromosome browser in January. They have also indicated that they are working on their matching issues. The chromosome browser is particularly good news, but matching must work accurately or the chromosome browser will show erroneous information. Let’s hope January brings all three features. LivingDNA indicates that they will be introducing matching in 2018. 2018 – What Can You Do? What can you do in 2018 to improve your odds of solving genealogy questions? If you have transferred a version of your DNA that does not produce full results, such as the Ancestry V2 or 23andMe V4 test to Family Tree DNA, consider testing on the vendor’s own chip in order to obtain all matches, not just the closest matches available from an incompatible test transfer. Test Y and mitochondrial DNA at Family Tree DNA. Find ways to share the stories of your ancestors. Stories are cousin bait. My 52 Ancestors series is living proof. People find the stories and often have additional facts, information or even photos. Some contacts qualify for DNA testing for Y or mtDNA lines. The GREAT NEWS is that Amy Johnson Crow is resuming the #52Ancestors project for 2018, providing hints and tips each week! Who knows what you might discover by sharing?! Here’s how to start a blog if you need some assistance. It’s easy – really! o Find out if a male representing a Y line in your tree has tested, and if not, search through autosomal results to see if a male from that paternal surname line has tested and would be amenable to an upgrade. o Mitochondrial DNA test people who descend through all females from various female ancestors in order to determine their origins. Y and mtDNA tests are an important part of a complete genealogy story – meaning the reasonably exhaustive search! o Autosomal DNA test family members from various lines with the hope that matches will match you and them both. o Test family members in order to confirm a particular ancestor – preferably people who descend from another child of that ancestor. o Making sure your own DNA is in all 4 of the major vendors’ data bases, plus GedMatch. Look at it this way, everyone who is at GedMatch or at a third party (non-testing) site had to have tested at one of the major 4 vendors – so if you are in all of the vendor’s data bases, plus GedMatch, you’re covered. Have a wonderful New Year and let’s make 2018 the year of newly discovered ancestors and solved mysteries! You still have time to order that DNA kit in time for the holidays. Even if you don’t have someone in mind to give it to immediately, stockpile while on sale so that you have one handy when you need it. And you WILL need them – guaranteed – hopefully sooner than later. I offered to pay for three tests last night. So far, I haven’t heard back, but hey, it’s still early!!! Truth is, it’s really more a gift for you than it is for them, but I won’t tell if you won’t. What I’d like for you to do is to think about your most favorite, or maybe that should be your least favorite, brick wall. The one you’d really like to fall. For many of us, that’s the one closest to us in time. Or maybe it the one most long-standing. Think about how DNA might be able to help you break through that brick wall, or at least reveal more information about that person, which in turn might help you break down that brick wall. After all, you don’t know what you don’t know. I’m going to use my Nancy Moore for an example. We know she married John R. Estes on November 25, 1811 in Halifax County, Virginia and around 1820, she and John headed for Claiborne County, Tennessee. Nancy’s parents were the Reverend William Moore and his wife, Lucy, whose surname we don’t know. Of course, that also means we don’t know anything else about Lucy’s heritage. For Nancy Moore, I’d really like to know about her mother’s heritage and her father’s line as well. Like they say, for every brick all you break down, you get two more as a reward! Because information about the patrilineal line can be gleaned from Y DNA inherited by males from their fathers, Nancy’s descendants can’t test directly, but descendants of her brothers can – and have. We have the Y DNA of Nancy’s brothers’ descendants from two different lines – so confirming that their common ancestor, Nancy’s father, also carried that same Y DNA. In this case, we’re waiting for additional Moore Y DNA matches from someone whose ancestor goes further back in time than our known Moore line. 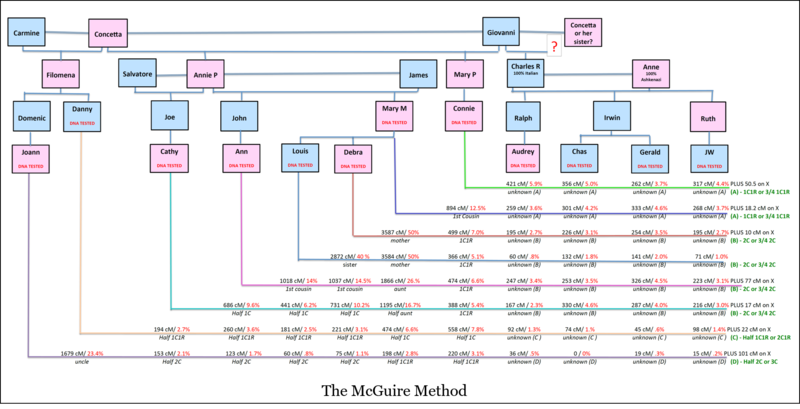 I’m beginning to wonder if our Moore line was really a different surname in the colonies – meaning that somehow the DNA and the surname got separated, forming a “new” Moore line. We have few Moore matches and only through known descendants of William or his brothers, but then again we don’t have any close, high quality matches to other surnames either. Matches provided through Y DNA testing are invaluable, because they help you focus on the direct line paternal genealogy. While waiting for those matches to materialize, I could offer to purchase an upgrade to the autosomal Family Finder test for any or all of the Moore cousins who have already tested. That might help immensely. If you don’t have the Y DNA of a paternal line, check your Family Finder matches at Family Tree DNA, or your matches at Ancestry, particularly if you have a Circle for that ancestor, and see if there is a male by that surname who would consider taking a Y DNA test. MyHeritage has a search function for matches and trees. Review the trees for your DNA matches and see if you can run any male line forward using genealogy and then contact currently living people, asking if they are interested in genealogy. I never broach the subject with DNA, just with a general inquiry. If you can’t generate any interest, they aren’t likely to test anyway. Ask about or offer to share photos if you have any. That’s always a good ice breaker. Inquire about oral history too. Even if they aren’t interested in DNA testing, stories are a goldmine of their own. When I find a candidate, I simply offer to purchase the DNA test. I don’t want them to hesitating even for a minute while thinking about price. I explain that I have a testing scholarship for that line. In the chart below, you can see that Y DNA is passed along the direct paternal blue line and mitochondrial DNA is passed along the matrilineal red line. Neither the Y or mitochondrial DNA is ever mixed with the DNA of the other parent, so it acts as a direct line periscope peering far back into time. A veritable gift direct from your ancestors. Nancy Moore and her mother Lucy are complete blank slates. I hate that. As with so many other early lines, there’s always that rumor of Native heritage. That rumor seems to be very prevalent when a female’s surname is unknown, and I suspect that “must be Indian” became a very early “reason” for not knowing or being able to find a female’s surname. I suspect that comment got recorded as fact, and here we are today with many rumors and still no surname. But now, we have another avenue to pursue. A mitochondrial DNA (mtDNA) test on Nancy’s descendants who descend from either Nancy or her mother through all females to the current generation would do multiple things for me. I would immediately be able to confirm or refute the possibility of Native American ancestry in that line. Lucy, Nancy’s mother was probably born about 1750, someplace in Virginia, so Native ancestry is possible, if not probable. DNA matches to other people could be useful, either directly in terms of matching or in the larger picture showing me likely areas that Nancy and Lucy’s ancestors lived before immigrating to what became the US. Am I looking at a German family, an English line, or what exactly? Looking at the mapped locations of the matches of Nancy’s descendants may help identify a location. And that’s far more than you knew before testing. Testers receive a wealth of information with a mitochondrial DNA test. For example, here’s what I learned about my own mitochondrial DNA line. Women pass their mtDNA to all of their children, but only females pass it on. This means that men in the current generation can test for mitochondrial DNA as well. Cousins are the key to autosomal DNA which provides matching across all of your ancestral lines – assuming at least some relatives have tested. Therefore, you need to test as many cousins as you can find and talk into testing. Because those cousins will match you, and/or each other, on different parts of your ancestor’s DNA. Barring a second unknown line, the common ancestors are your common couple, in this case, William Moore and Lucy, Nancy’s parents. My goal is to find and test as many descendants of Nancy and of her siblings as possible. When unknown matches match to multiple Moore cousins, especially on the same segment, that’s a huge hint as to which line we all descend from. Cousin matching is how brick walls fall. After enough cousins have tested, I will begin to see repeats of matching to some family who is unknown to me. For example, let’s say that I see the surname Henderson repeatedly in the matches descending from both Nancy’s descendants and Nancy’s siblings’ descendants. That’s a powerful hint as to where I should look for either Lucy’s ancestry, or maybe William Moore’s. The power of numbers, meaning in terms of cousins testing, is exactly how breakthroughs occur utilizing autosomal DNA. Another benefit of autosomal testing is that you can make one test work for you in multiple ways. Some cousins may have already tested elsewhere. If that’s the case, ask if they will test at your favorite vendor, or transfer their DNA to that vendor, if your vendor accepts transfers. For a list of which companies accept transfers from who, click here. Transfers to both Family Tree DNA and GedMatch are free, and both offer advanced tools for either a minimal one-time cost of $19 at Family Tree DNA or a minimal monthly subscription of $10 at GedMatch. There are many tools at both sites for free, and since not everyone uploads to either site, you should have the DNA you need to work with at both. Still trying to figure out who to test? It’s Monday during the holiday season, so that means it’s coupon day, courtesy of Family Tree DNA. If you can use one of my coupons below to help focus on your goals, please do. If you are currently a Family Tree DNA customer, you have a coupon on your own page as well. I just noticed, shipping is reduced too through 12-15-2017, so that’s an additional way to save. Return postage is included within the US. Click here to check your coupons, or redeem mine! Please feel free to add any of your own unused coupons that you’d like to share in the comments of this article.